Green beans can be quick, simple and very tasty. Especially when you cook them up as an island delicacy. 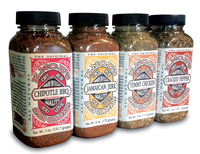 Jamaican Jerk seasoning has been used on vegetables since Jerk seasoning has been around. Below is a simple preparation for green beans that brings beans into a whole new light. Cut the tips off of the green beans. You can leave them whole or cut them into bite size pieces. It is important that they are similar in size either way. Heat about 1 tablespoon of oil in your pan (med- high) until it just begins to smoke. Toss in green beans and toss lightly for about 1 1/2 minutes. Sprinkle about 1 tablespoon Knox's Jamaican Jerk dry rub onto beans and toss to coat. This recipe can be adapted for just about any vegetable. We personally have tried it on cauliflower, carrots, asparagus and onions.